Designed for background and general purpose audio playback, the new AD-C42T is compact and acoustically matched to the entire AD Series. Rated for 40 Watts continuous power handling and able to take up to 160 Watt peaks, the compact AD-C42T is suitable for a wide variety of ceiling installations. 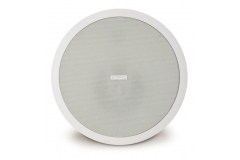 The 4" woofer is equipped with a polypropylene cone for protection in humid environments. 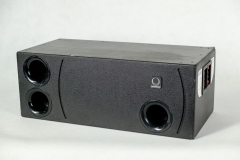 The driver features a synthetic rubber surround and in its sealed enclosure is optimized to deliver useable low frequency extension below 70 Hz. The high frequency device is a co-axial, post mounted 0.75" dome tweeter with a titanium diaphragm and a cloth surround. The coaxial post is mounted slightly off center in relation to the low frequency driver in order to lessen the destructive interference often found with axisymmetric post mounted coaxial systems. The conical dispersion of the AD-C42T is 100° and sensitivity measures 88 dB SPL. 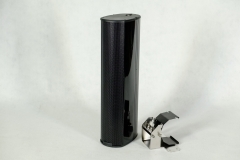 The baffle and mounting tabs are molded from high- impact polystyrene. The rear enclosure is a heavy gauge, powder coated steel. The attractive aluminum grille is backed with an acoustically transparent white cloth. On the rear of the enclosure is an input cup that features a conduit attachment point plus an additional knockout for daisy-chain wiring. Input signal connection is made with a high temperature resistant ceramic screw terminal for compliance with European safety standards. The AD-C42T is factory shipped with C-rings and tile rails for installation. New construction rings (ADC-NC4) and mud rings (ADC-MR4) are also available separately. The AD-C42T is equipped with a 70/100 V transformer with multiple taps and an 8 ohm bypass.